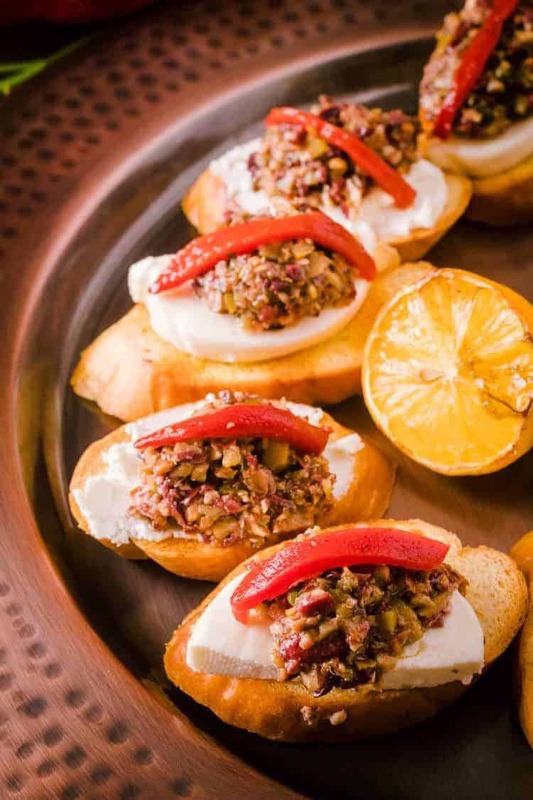 Savory, salty, umami flavor with fresh herbs and hints of heat and acidity make this easy Mixed Olive Tapenade Crostini with Grilled Bread perfect for a casual game day snack or elegant enough to serve as an appetizer for your special occasion menu! Do you eat with your eyes like I do? I love the beautiful colors on this plate of Mixed Olive Tapenade Crostini with Grilled Bread! I have seen so many photos of dull-looking olive tapenade, looking like a grey paste. Many of the recipes in the blogosphere strike me as being “one note.” I love layers of flavor, and that is how I’ve always approached my food. A good tapenade requires more than just olives. This one includes mixed olives (more colors 😀 ), garlic (roasted please! ), shallot, capers, crushed red pepper, zest and juice of a lemon, sherry vinegar, and anchovies. YEP. ANCHOVIES. Love, love, love my anchovies! 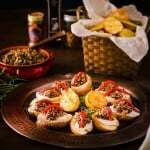 They bring rich, umami flavor to so many favorite foods – caesar salad, bagna cauda, salad niçoise (or my Tuna Niçoise Sandwich with Aioli, Tapenade, and Soft Egg). When I order food that features anchovies, I frequently hear “ick.” How do you respond? 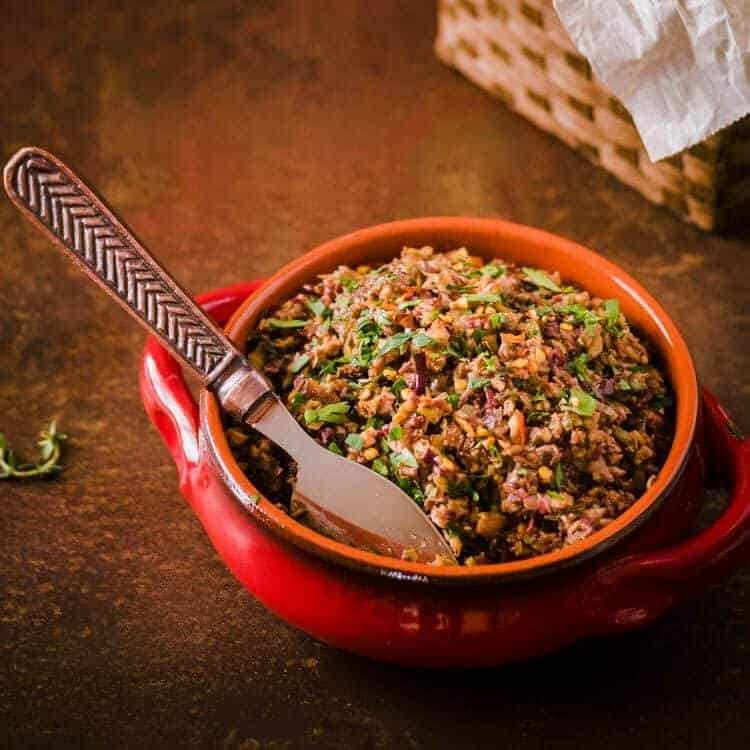 Quality ingredients yield a better tasting tapenade. I frequently go to the olive bar at my local market, and find many different varieties. I fill a tub with different colors, and include a few cloves of roasted garlic (just in case I don’t feel like roasting a bulb). I always include some pimento stuffed olives for… color. 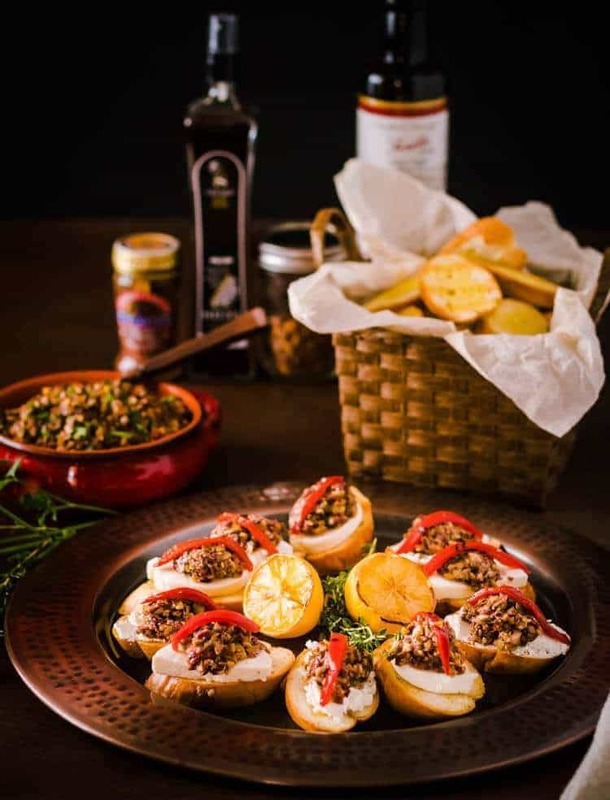 So, back to the Mixed Olive Tapenade Crostini with Grilled Bread… The tapenade involves adding ingredients to a food processor and pulsing them to the desired consistency. I prefer a mince to a rough chop or a paste. Slice a baguette, brush lightly with olive oil, then grill it. I vary the cheese layer; on photo shoot day, I used fresh mozzarella and chèvre. We definitely preferred the latter, but both were delicious. Try it with your favorite cheese. Layer the cheese on the grilled bread, top with a dollop of tapenade, then garnish with thin-sliced piquillo or roasted red bell peppers, fresh herbs, a thin slice of grilled citrus, additional crushed red pepper… You get the idea! Do you have anything planned for Game Day (Super Bowl)? Having left our football-loving friends in New Mexico, we’ll probably spend a quiet day at home, but a tasty snack (or three) may be in the making! Rinse and drain the olives and capers. Add to the bowl of a food processor. Add remaining tapenade ingredients (garlic through olive oil). Pulse until desired consistency is achieved. Scoop into a bowl, and set aside. Preheat grill to medium-high. Brush bread lightly on both sides with olive oil. Grill until you have nice brown grill marks, being careful to not burn your baguette! To assemble: Layer a slice of grilled bread with your choice of cheese, a dollop of tapenade, and garnish of choice. Enjoy! Many markets now have olive bars, and this is a great way to get a variety of olives without buying several jars. Remember to get pitted olives! As I mention in the post, I often buy roasted garlic with the olives. I love the smooth, mellow flavor of sherry vinegar. A good quality wine or champagne vinegar will work. Avoid cheap, acidic vinegars. As mentioned in the post, on this day we used fresh mozzarella slices on some, and spread softened chèvre on others. Manchego is another good option. Be adventurous! Calories are an approximate based on 1 tablespoon of a high-quality commercial tapenade with 1 1/2" baguette slice and 1 1/4" mozzarella slice. There are too many variables in this recipe to do more than a ballpark figure! I love this salty, savory, acidic, oily tapenade. It's fantastic! Thank you darlin'! I do too! Well, what are you waiting for? Make some!